Published: April 3, 2012 at 02:50 p.m. When Nike signed its five-year exclusive deal with the NFL, some were concerned that the famously forward-thinking company would have radical outerwear changes in store for each of the 32 teams. By and large, these fears went unrealized. Several teams debuted small tweaks to their uniforms at Nike's huge launch event Tuesday in New York, but most uniforms won't look much different than what you saw on your favorite team last season. The exception to the rule is the Seattle Seahawks, who received a complete makeover of their home and away jerseys, not to mention adding a third gray, alternate uniform. According to The Associated Press, the changes to Seattle's uniform include a deeper shade of dark blue, neon green highlights throughout and a third alternate uniform in a shade of gray. Gone is the shade of blue that debuted when the Seahawks moved into their new stadium in 2002. The uniforms also incorporate graphics of Pacific Northwest coastal Indian artwork along the side of the uniform tops and pants and around the neckline (the side of the jerseys feature 12 feathers to represent the team's famous "12th Man."). The Seahawks logo is larger on the helmets and wraps around the back. It's practically a personality change for the 36-year-old franchise. This sharp left turn perhaps makes sense when you remember the Seahawks are in the backyard of Nike, which is based in nearby Beaverton, Ore. The two are natural dance partners, at least geographically. 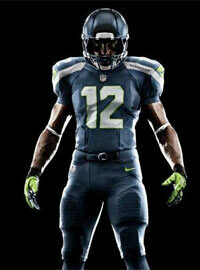 Reviews of the Seahawks' new look have been mixed, but no one will call the uniforms dull. That's part of Nike's thing, of course. Look no further than the University of Oregon, the company's eternal pet project. Oregon -- the alma mater of Nike co-founder Phil Knight -- has become a school as famous for its vivid uniform designs as anything else. Student-athletes at the school have cited the Nike partnership as a factor in their decision to attend. Style created substance, as the Ducks became a major college football program. Expecting NFL free agents to be similarly swayed might be asking too much -- Benjamin green remains the preferred color scheme in the pros, after all. But at the very least, the Seahawks have visually presented themselves as a technicolor operation set amidst the stodgy gray establishment.